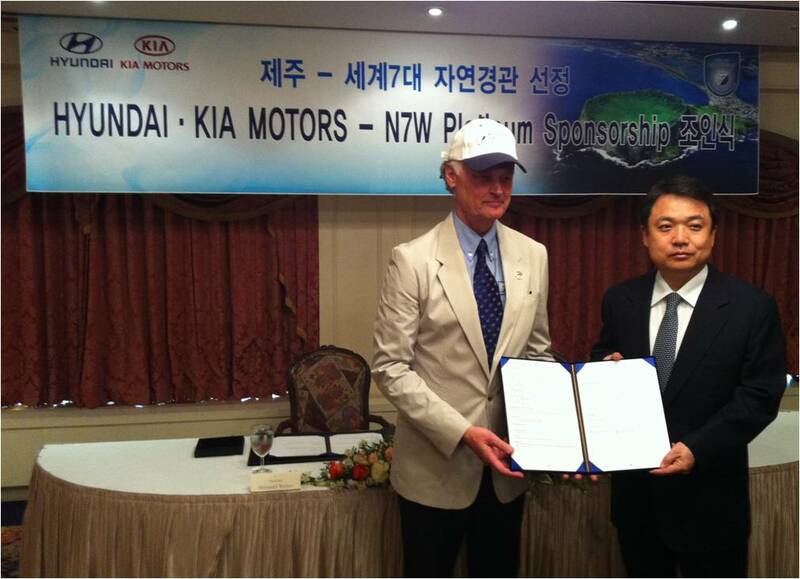 New7Wonders President Mr. Bernard Weber and Hyundai Motor Company President Mr. Chung Jin Haeng with Jeju Island sponsorship agreement. Hyundai Motor Company and Kia Motors Corporation are Official Finalist Supporter platinum sponsors of Jeju Island in the New7Wonders of Nature campaign. The sponsorship agreement was signed in Seoul, Korea, by Hyundai Motor Company President Mr. Chung Jin Haeng and New7Wonders President Mr. Bernard Weber. Editorial note: A recent study by JDI in Korea has confirmed that being successful in the New7Wonders of Nature campaign can generate over US$ 1.8 billion in economic value per annum for each winner. Therefore many leading companies are choosing to become New7Wonders Official Finalist Supporters sponsors not only for the powerful marketing and image benefits, but also for the potential important economic impact on their brands and businesses.